CASA Kane County is a nonprofit volunteer organization that has been advocating for the best interests of abused and neglected children within the Juvenile Court system since 1988. 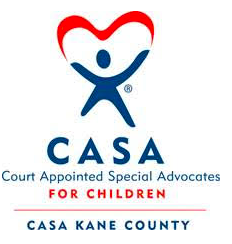 CASA Kane County recruits, trains, and supervises community volunteers who serve as Court Appointed Special Advocates and Guardians ad Litem (CASA/GAL) for children who are in court due to abuse, neglect or private guardianship. The goal is to ensure that every child is placed in a safe and permanent home allowing them the chance to reach their full potential in life. CASA/GAL volunteers areappointed to each case by the Juvenile Court Judge. As a child’s Guardian ad Litem, CASA volunteers are an officer of the courts and a party to the case and have the authority to obtain records and information about the child. CASA/GAL volunteers visit the child and meet with the parents, guardians, teachers, medical professionals, and other individuals in the child’s life. They gather information and compile it in a report that is then presented to the Judge prior to every court hearing. Since CASA/GAL’s are assigned to only one case at a time, they have the ability to spend the most time with the child and gather the information needed in making life changing decisions. There are many possible positive outcomes for a child—reunification, adoption, independent living, or guardianship with relatives for that child to receive a safe and permanent home. 40% of the children we serve are under the age of 5. 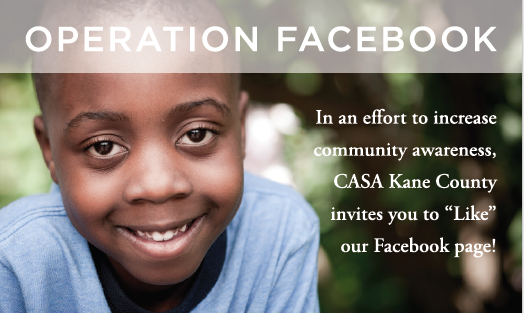 CASA Kane County’s 225 CASA/GAL volunteers are serving over 600 children throughout Kane County annually. CASA Kane County is one of 1,000 CASA organizations across the country, and one of 36 within the State of Illinois. The organization is a registered 501(c)(3) organization, and relies solely on philanthropic support from individuals, grants and special event fundraising to support its operations. The CASA Kane County office is located in the downtown district of Geneva in the old courthouse that represents a county with over 500,000 people serving 28 cities.